Female EJ and her new partner George produced three eggs last month at RSPB Scotland's Loch Garten reserve in the Cairngorms. 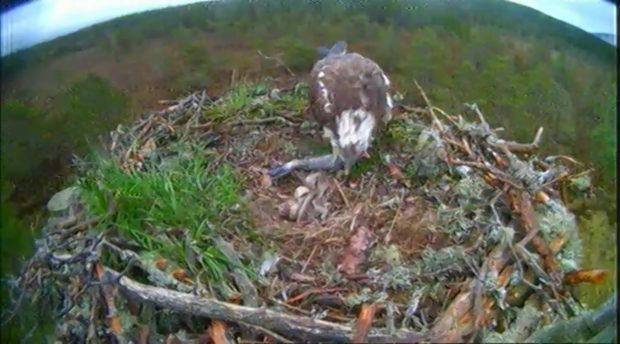 Female EJ and her new partner George produced three eggs last month at RSPB Scotland’s Loch Garten reserve in the Cairngorms – known as the home of the UK’s breeding ospreys since the 1950s. Conservationists watching the nest fear the eggs are doomed however as the male is regularly going awol and not bringing enough fish to the nest. As a result, EJ has had to leave for long periods to feed herself, including two-and-a-hours on one occasion, leaving the eggs unattended and vulnerable to the weather and predation for two and a half hours on one occasion. Jess Tomes, the Loch Garten reserve manager, said: “After making a promising start, bringing in really big fish and incubating the eggs, George appears to have lost interest. “EJ went seven days without any fish before he finally brought one in on Sunday — but since then he’s brought nothing. “Generally he comes in the early morning empty handed and tries to mate, then goes off for the rest of the day.